These people had quite a lot of garden sculpture - representing a wide range of faiths and cultures! 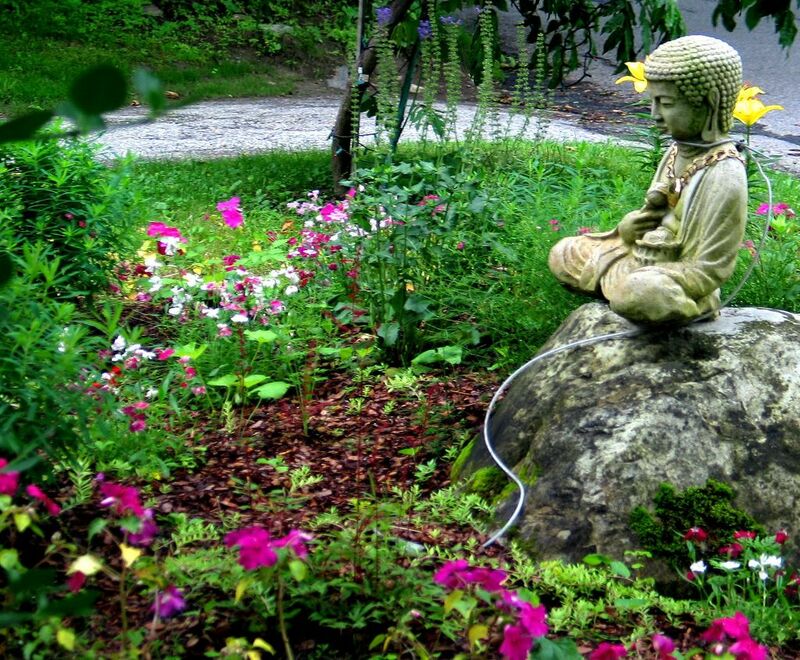 A Peace Garden. What the world needs more & more. Jenny, have you seen Luggi's L.A.garden with the stone gorilla & lions a few days back? Different strokes...I think these residents have more taste (no crit. of Luggi, only the people livingin that house!). Is there ANYTHING ugly in Sharon? Looks like heaven to me. Is it a rope around his neck, perhaps not to be stolen? Very pleasant photo and garden, indeed! Very peaceful, like he is studying the flowers as well. Is Alice correct? Is the rope there to prevent theft? Can you imagine the bad Karma behind stealing that statue? I'd assumed it was an electrical wire for a night light... but I haven't been by after dark to see for sure. It seems too loose to be a theft-prevention device! I agree with Juggerpix, ah ah, but so many mad people...I hope not too many of them in Sharon which seems so calm! 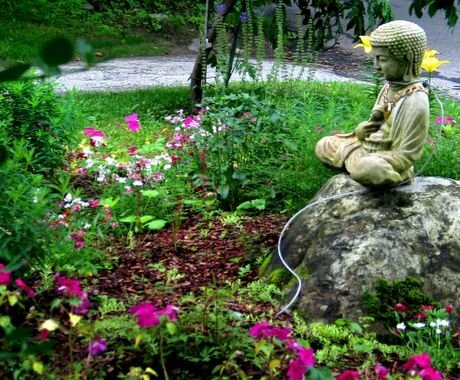 I had a Buddha in my back yard for a number of years. Now I live in an apartment, and he sits on my balcony.